Welcome to AuthenticUlster.com, your source for premier, tailored, cultural tourism associated with the history of Northern Ireland. We specialise in providing the heritage tourist with a deeper, richer experience than regular tours will offer. Using only expert tour guides and with access to unique locations, our aim is to provide an unparalleled discovery of our remarkable heritage. We have developed a select collection of tours and products, with more in development. Follow AuthenticUlster on our social media channels or register to stay informed by email newsletter. Come and see the birth place of one of the most famous writers –C.S. Lewis, creator of Narnia, who was born in Belfast, and Ireland both north and south had a profound influence on his work. Discover with us how the landscapes, traditions and heritage of Northern Ireland help to shape some of the most all inspiring stories ever written. 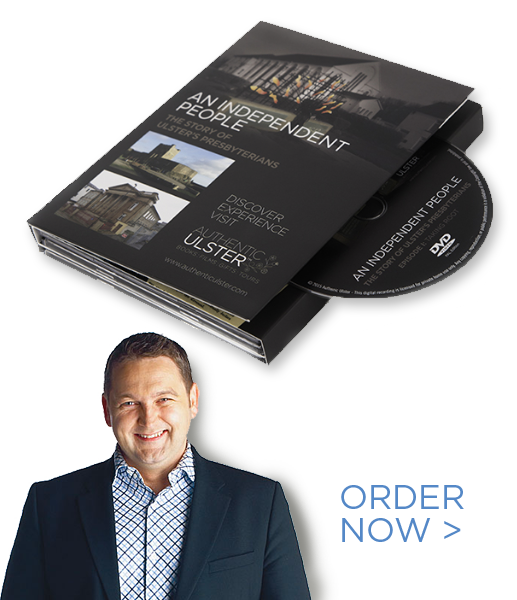 3-DVD box set of the acclaimed BBC Northern Ireland series, charting the story of Ulster’s Presbyterians. Presented by William Crawley. At its closest point a 12-mile stretch of water separates Ulster from Scotland, across which people have been moving to and fro for millennia. The Presbyterians who arrived here in the seventeenth century have changed the face of Ireland and the world. They were at heart of the American struggle for liberty. Their missionary endeavour carried the Gospel to the four corners of the earth. They planted the seed of republicanism in Ireland, something which continues to have ramifications to this day. These Presbyterians planted a reformed faith which spread to four continents. They were the marginalised who became the powerful, the dissenters who became the conservatives, the outsiders who became the establishment.